So, at the moment, I am really juggling three different builds: I am doing updates on my full scale R2-D2, I am working on a dome for BB-8, even though I am definitively #NOTBUILDINGBB8 .. and then I’ve got this 50% scale build. 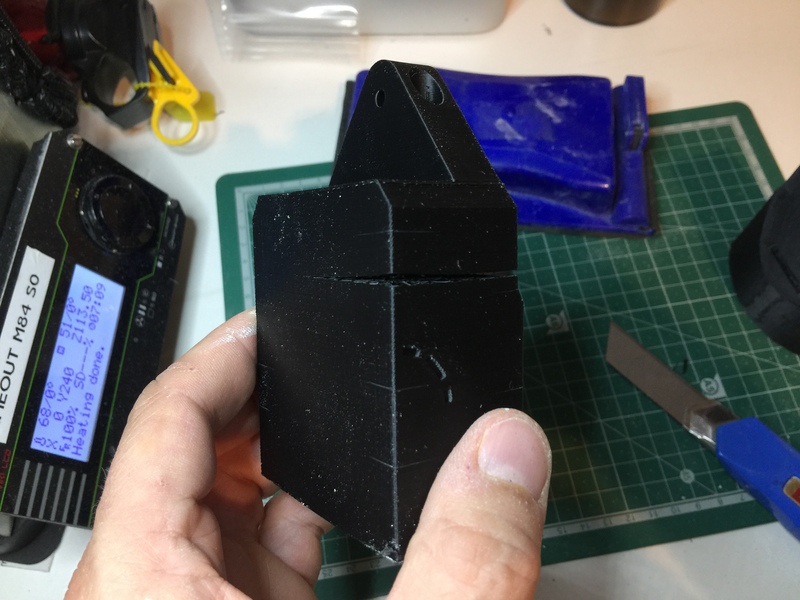 The biggest drawback of changing from 40% to 50% build, is that the pieces I had done for my 40% build is now totally useless, so back to scaling up (and fixing some issues with the model) and printing. These under shoulder details are really tiny. 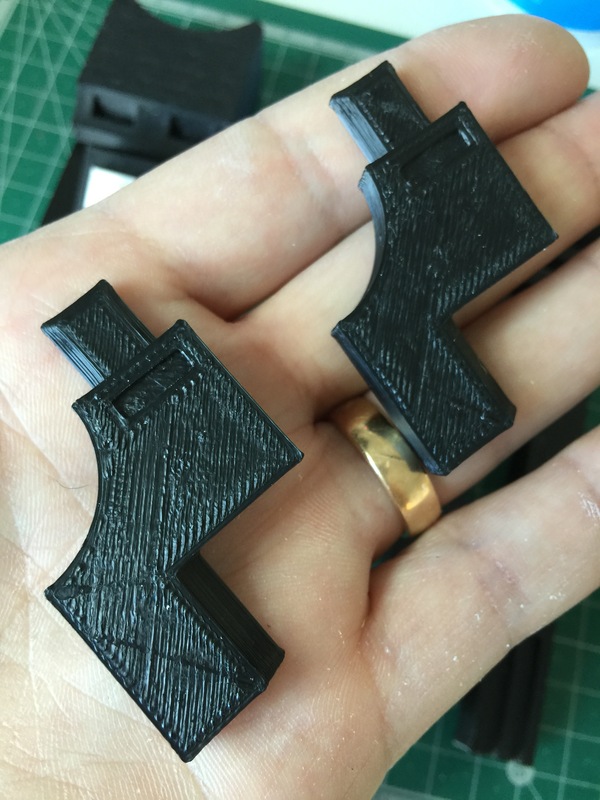 They have been printed with a layer height of 0.05 mm and was printed in two halves, that was just glued together. This image is taken through my magnifying glass. Building really wreaks havoc on your fingernails and dries up your hands. 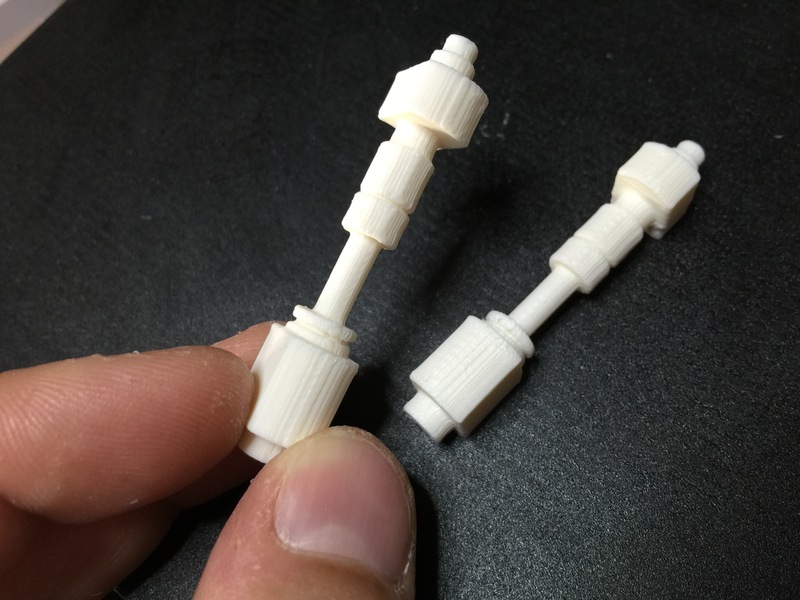 Not printed quite in the same detail level are these shoulder hydraulics. They will look great when sanded and treated with rub and buff though. The booster covers now in correct scale. 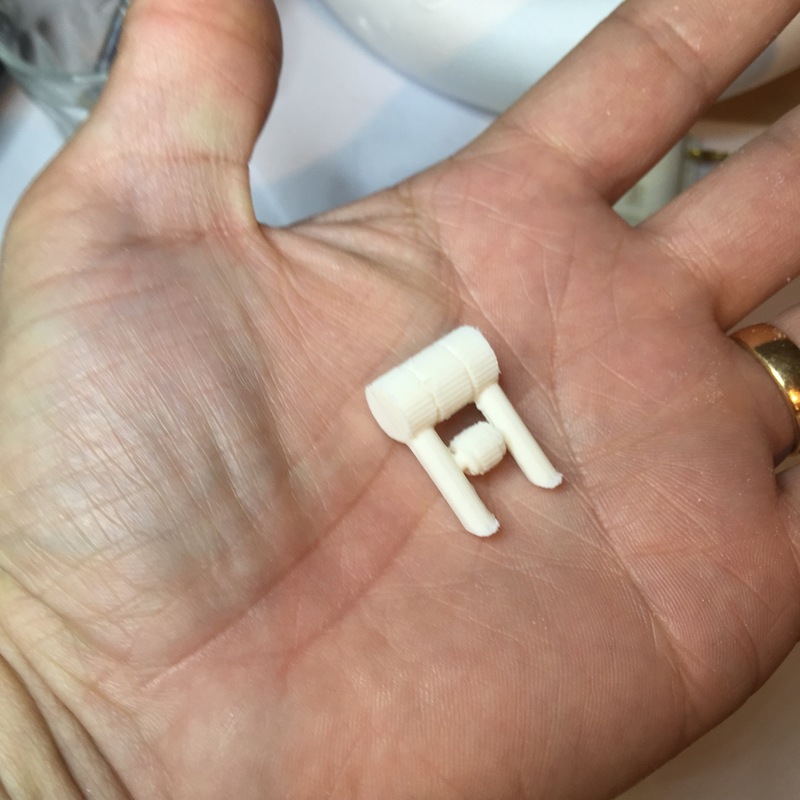 The leg struts that I printed last week fits great! To get a comparison to the full scale: Here is the newly made Large Data Port … or should I say the Tiny Data Port? Another small crack on the other side.. But no where near as bad as this big one that went half through! 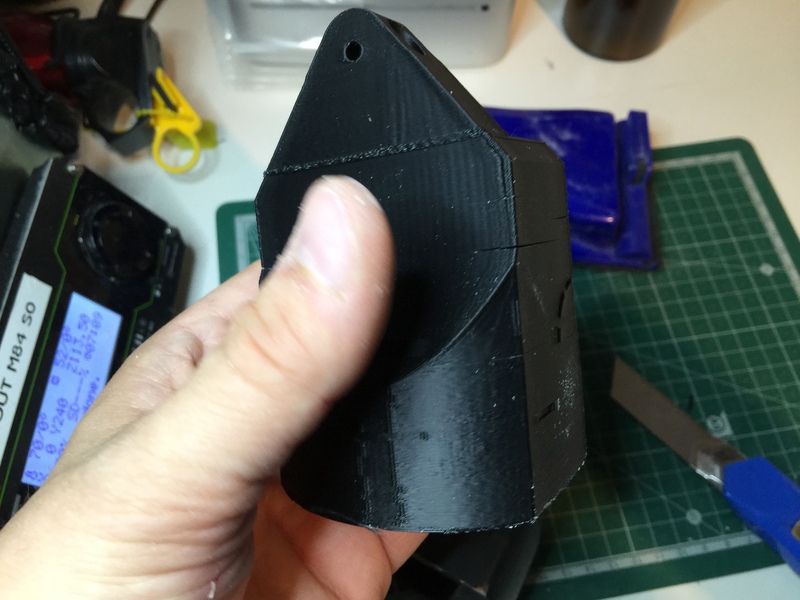 I will do a post about how to fix these things in the future without having to do a totally new print. Hurrying a build will always come back to bite you later! When I originally built my R2, I was in a building frenzy. In a way, it was almost therapeutic for me, as I needed to get my mind off things, and really focused as much as I could into the build. The legs was one of those first things I made, and I did not let the fact that I did not have a drill press stop me! So, instead of .. I don’t know .. ask any of my friends if any of they had access to one, I basically drilled the holes in my ankles freehand. I know for a fact, that these holes have not been straight. 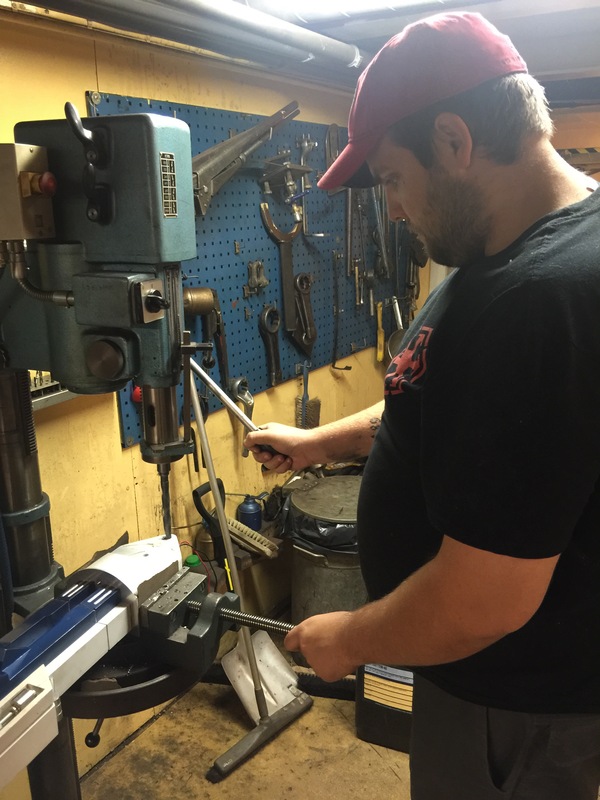 So, armed with a plan, I took R2’s legs to my friend Anton’s work (where they have a proper drill press) and got to work. 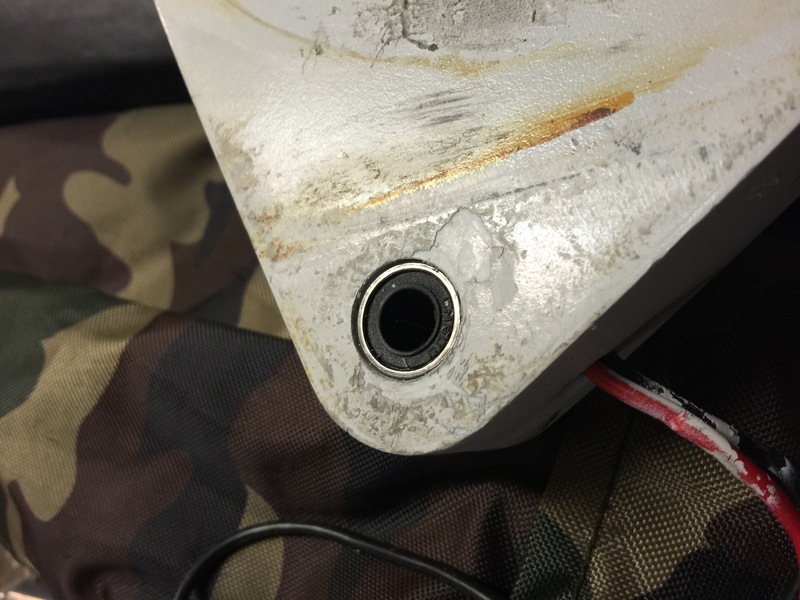 A few years ago, I did have the foresight to protect the existing ankle holes, so I had drilled the holes slightly larger and inserted a piece of aluminum tube to not let the threaded bolt eat into the plastic. 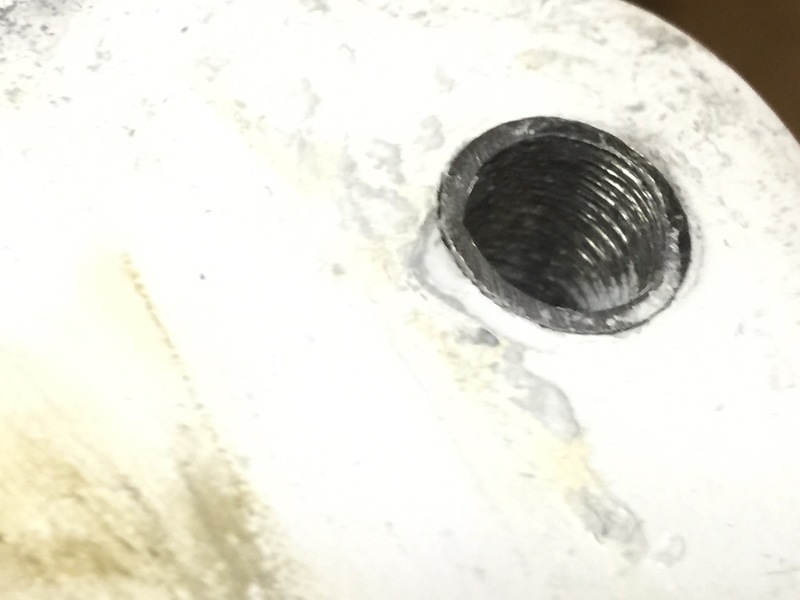 When the foot was removed, I got proof that my ‘protection plan’ had worked as it should: The threads from the bolt had really eaten into the aluminium bolt! Just imagine what could have happened if it had gone straight into the plastic ankle? So, the force has been strong enough to not only impress the threads into the aluminium tube, but also to slightly deform the hole! My plan was to make a new hole, a straight hole this time, and rather than the existing tubes, I would insert some sort of bushings into the hole. 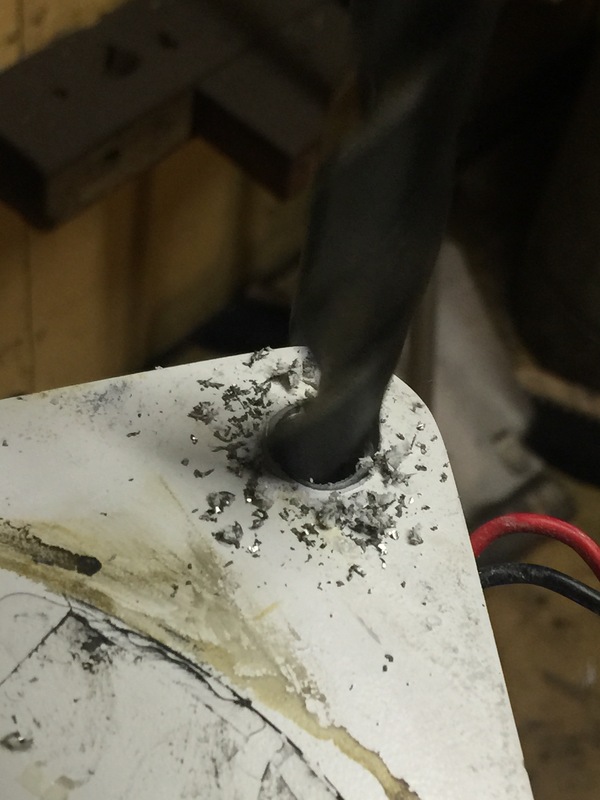 First step was to affix the leg to the drill press… and slowly drill through both ankle and the existing aluminium tube to straighten up the hole.. Since the aluminium tube was only fixed with E-6000 inside, it soon pushed out the other end, while the drill made a straight hole through..
A much better solution, and a more solid contact area towards the plastic! 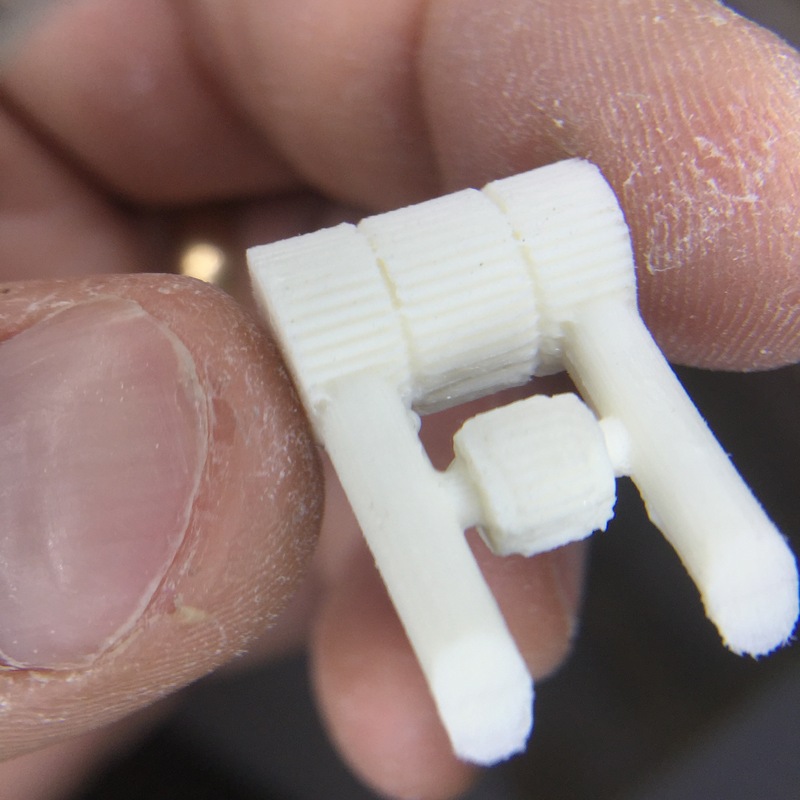 I also took the opportunity to attach the new motor holders (as seen in “Fixing a hobbled droid” and “Fixing a hobbled droid, part II”). Yes, even though I had made these new motor holders way back, I had to abandon them due to a motor dying on me, but this has since been fixed, and this seemed like a great opportunity to put them in action! Since fixing this, I have not yet had time to do a proper event with R2, but I’ve got a two day event in September that will be a perfect test. 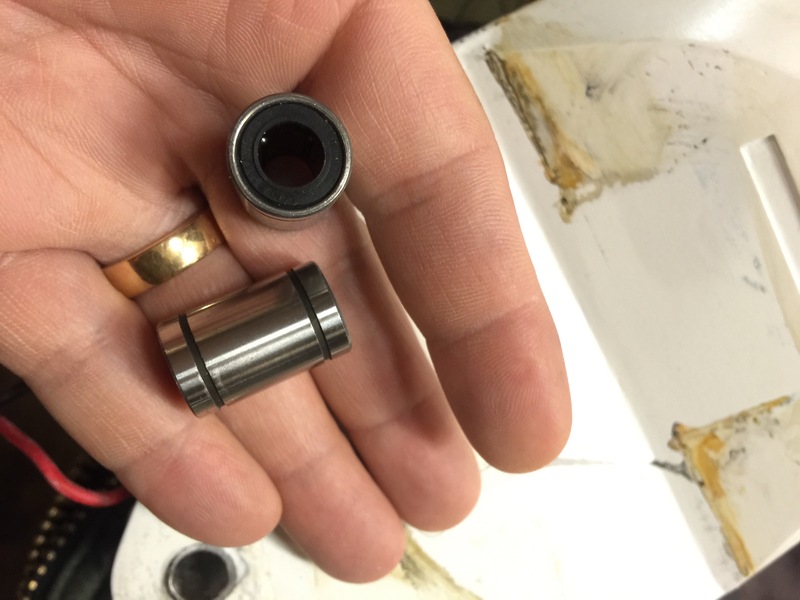 I will bring along my backup motor holders just in case… you never now. I’m so close to the finish, I can smell it! So, these last days of core building is nearing its end. More and more small fixes are taken care of, and the droid is getting more and more finished! Construction wise, all that is left is filing 3 pieces of metal for the foot strips, building two end caps for my ankle cylinder, and dress those in aluminium tape! After that’s done.. well . I need to file down my battery box harnesses a bit, glue them in place, and also glue in the under shoulder details at my left leg! 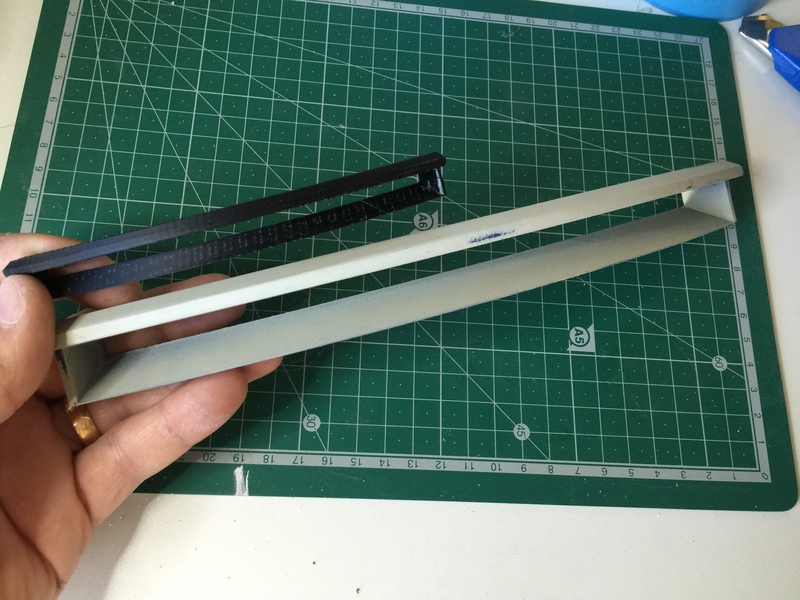 Once those small things are done.. construction of “phase 1” as Valisk_61 put it… is finished! Naturally, I’ll need to weather the legs and skirt.. So: What has happened since last time then? 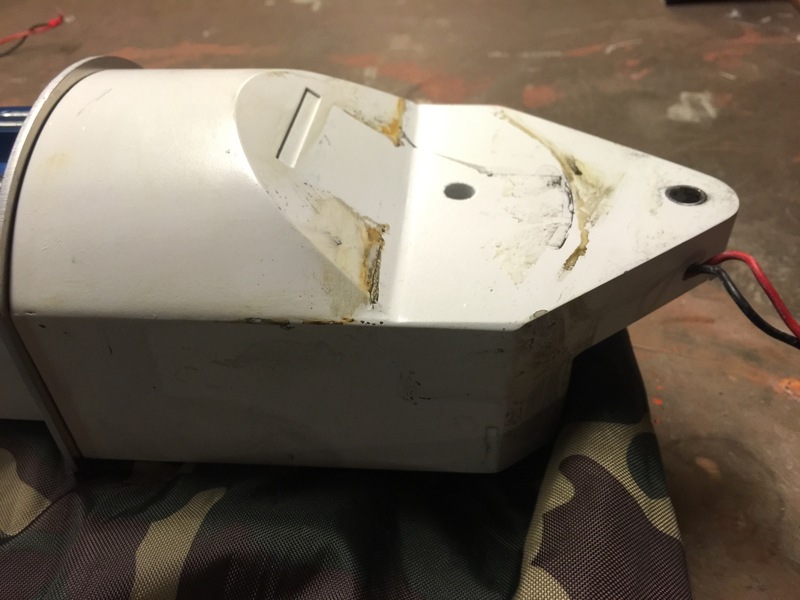 Wrapping aluminium tape around something, working hard with a glove (or you’ll cut yourself, I know) to smoothen it out, then finally sanding with 400 grit sand paper, gets you a pretty good looking solid aluminium look! Center foot construction is 100% complete! I just need to add a bit of weathering to the cylinders and the wedges and it is a done deal! The wedges are scratch built from styrene, if you wonder. Looks fairly decent as well, I think! My, after weathering the droid’s body and the center foot, the main foot and leg looks so plastic and fake without any grime! This cannot do! [tm] (Thank you, much obliged!) and started to drill and file and all. Once done, it looks like quite an improvement from what I started with, or what do you think? Once this was done, it was time to reattach the hoses..
Now where do this one go? top or bottom hole, I can never remember..
There’s been more bits and pieces done today as well, small tidbits, painting of the second booster cover took place (Why don’t I paint them both at the same time to begin with? ), built and painted the rest of the ankle wedges, mounted the ankle cylinders, the holders, well .. in fact, most things!